WARNING! The following blog posting contains words -- mono and multi-syllabic configurations of letters that have been known to confuse, distract, misrepresent, and otherwise complicate the cognition of readers attempting to understand another person's experience. 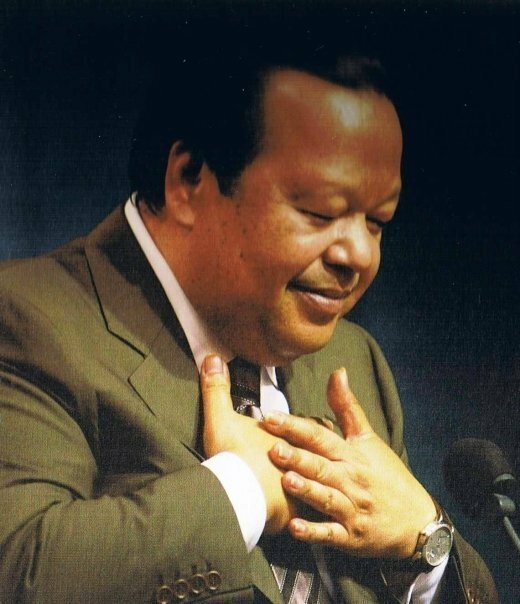 That being said, I am going to take a whack at describing what it was like for me to see Maharaji (aka Prem Rawat) on September 23rd in Asheville, North Carolina, where he spoke for 60 minutes to approximately 1,200 people. Fast forward to the morning after. I am sitting in the Asheville Regional Airport, sipping my tall soy latte and waiting for my plane, when the very likeable Ellen Kirschner sits down beside me, laptop in hand and, after a few pleasantries, asks if she might interview me for an article she is writing for Words of Peace Global about last night's event. Ellen looks at her notes and asks me a few questions. I look at Ellen and give a few answers, underwhelmed by the vagary of what I have to say in the time I have to say it. Interview done, Ellen and I both stand and go our separate ways -- she down a ramp to Charlotte, me down a ramp to Newark. I present my e-ticket. I put my bag in the overhead rack. I listen to a disembodied voice tell me how to put my seat belt on. And then, like a ton of bricks, 30 minutes later, 35,000 feet in the air, it hits me -- what I really wanted to say to Ellen. What was it like sitting in a room with Maharaji? Like being an electric fan and having the plug pulled. Things slowed down. Way down. Everything came to a complete stop. My blades -- those finely honed, energy-efficient abilities I've been so busy developing to cool the room I call my life -- stopped spinning. Back to square one. Everything became still. Nothing was happening. But not the nothing that is the absence of anything. No. The nothing that is the fullness of everything. The moment of HERE. The moment of NOW. The moment that is already wonderful without anything extra needing to happen to make it so. This nothing, like a large bay window opening to the sea, allows me to feel the coolest of breezes -- a breeze that does not depend on my spinning blades for its origination. It allows me to enjoy who and what I am without even trying. What moves the breeze moves me. And it feels very, very good. Maharaji, somehow, has the knack for facilitating an experience that enables people, from all walks of life, to feel the fullness of the moment -- to be totally receptive. Receptive to life. Receptive to love. Receptive to the realization that everything is perfect just the way it is. At moments like this, I am filled with an extraordinary tidal wave of gratitude -- and I had one of those moments being with Maharaji, in Asheville, on September 23rd. What follows are excerpts from Maharaji's September 23rd event in Asheville. It is not a word for word transcription -- simply selected highlights as recalled by yours truly. Enjoy! "I am not here to lecture you and explain what someone else wrote. I am not here to provide theoretical conjectures on what your life might be -- or the shortcuts you can take. I am not here to tell you that you're all travellers on a journey. I'm here to tell you something else -- a reality you should know that is so sweet, so wonderful, and so profound." 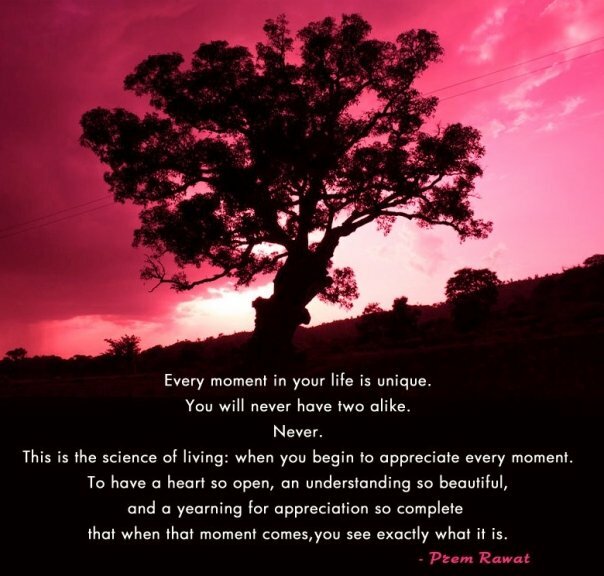 "Know the beauty that comes to you one breath at a time. 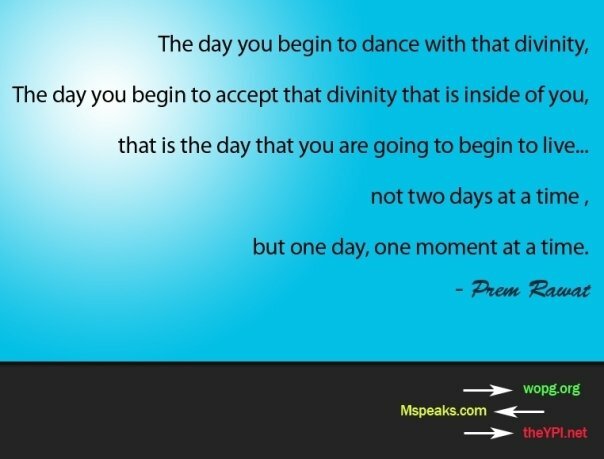 Understand what each day, each moment means." "We are so enamored by the idea of heaven after death that we fail to see the heaven we are living in." "Search as much as you can. I have no problem with that. But I do have one thing to say: If you search for something you haven't lost, you're going to run into a lot of problems. You're searching, but not finding because you've never lost what you're searching for." "Is the goal to search or to find? If it is to find, don't get caught in searching. Look! Actually look! Open your eyes and you will find it. Why? Because you have never lost it. The Divine you search for is within you. The day you lose the divine, searching is out of the question." "There are only two kinds of people in this world: People who have asked 'Who am I?' and people who haven't asked yet." "What would you rather have -- an operatic waiter who can sing the menu to you or another guy who actually brings the food? Me? Maybe I'm old fashioned, but I want the waiter with the food. The singing guy? Send me a tape or an Mp3." "Do you know that each one of us is completely different? There are some similarities, but they are superficial. There is one thing common to us all -- and that is: we can say THANK YOU!" "Have you ever been thankful for this life? Have you ever been thankful for this breath? Have you ever been thankful for understanding? Have you ever been thankful for this existence? Have you ever been thankful for today? Have you ever been thankful for yesterday?" 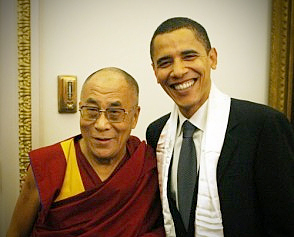 "You have an insatiable appetite for peace. Don't ask me why. You love this stuff! Peace! Joy! Nobody gets tired of it." "You think you weren't born with an instruction manual? Do you need it? Or are things pretty straight forward? Hungry? Eat! Thirsty? Drink! Tired? Sleep! Don't know? Know!" "What I offer people is a simple thing -- the gift of this Knowledge -- to put you in touch with something inside of you. Your life! Your existence! It's all good news!" "The most magnificent show is in town, folks. The most magnificent venues have been created -- YOU! And what is the show? What does the billing say? The Divine Is Playing In This Venue -- and believe me it's quite a show. If you don't find it, I have the tickets. Free! 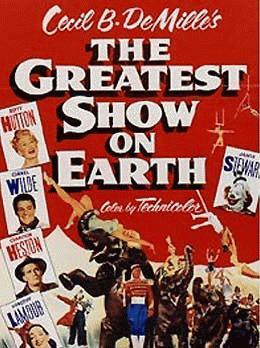 I have the tickets to the greatest show on earth!" The International Day of Peace ("Peace Day") provides an opportunity for individuals, organizations and nations to create practical acts of peace on a shared date. It was established by a United Nations resolution in 1981. In 2002, the General Assembly officially declared September 21 as the permanent date for the International Day of Peace. By creating the International Day of Peace, the UN devoted itself to worldwide peace and encouraged all of mankind to work in cooperation for this goal. Beautiful new song (and exquisite images) by Kim O'Leary. Thanks to the almost omnipresent David Klamph for posting this on the Heart of the Matter FB group which you should definitely join immediately even if you have other important things to do right now and are totally overdosed with FB. It's Never Too LATTE for Peace! Dalit Fresco likes coffee. 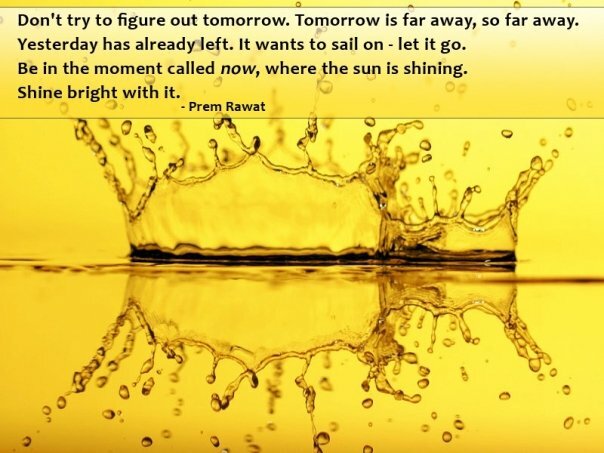 But she likes something even more -- and that is the feeling of peace inside herself made sweetly accessible by her teacher, Prem Rawat (aka Maharaji). Small, Tall, or Vente, the millions of coffee lovers who will frequent Starbucks on 9/21 will see this message and SOME of them will log on and feel the kind of buzz that goes far beyond cappuccino. PS: Feel free to take a photo of your note and email it to me on 9/21. I'll choose ten and post them on this blog faster than you can say "caffeination." PPS: This was Dalit's cool idea. I'm just helping to get the word out there. Thanks to Kim O'Leary for many years of extraordinary music...and to David Klamph for posting this on Heart of the Matter FB (where there are another 86 very inspiring videos). In honor of all the people who lost their lives on 9/11... and all the people who lost loved ones then... and all the people who felt that great loss in their hearts, here is a beautiful reminder of love, remembrance, and the preciousness of human life. Be Healthy! Keep It Simple! When I was in my 20s, I worked at the University of Virginia Medical Center. Initially, I was impressed when I heard the interns and residents spicing their diagnostic conversations with impressive sounding Latin words. It made me feel like I was in the presence of experts -- people in the know -- professionals to whom I could entrust my life should I ever get really sick. It's not just medical students who are enamored of complexity. We all are. Somehow, in our over-caffeinated, multi-tracking, digitally-assisted life, we have come to equate complexity with wisdom. Complexity is not wisdom. Complexity is complexity. Simplicity is where it's at. All the savvy people I know have a knack for keeping things simple. They demystify. They speak in the language of the people. They cut to the chase in a way that cuts no one in the process. My invitation to you today? Keep it simple -- no matter what path you're on. You will feel way better at the end of the day -- and so will all the people around you.